The final spot in Group A of the regular season in the FIBA Champions League is the prize for these two teams this week. The hosts earned their place in this round by defeating Rilski Sportist in the initial qualifying round while the Israeli side were handed a spot in the second qualifying round. A 24 point margin of victory in their opening round tie suggests that Minsk were in complete control against their Bulgarian opponents. There was even some consternation that the margin of home victory wasn’t as compelling as the away result, but this was as much down to their squad rotation. This was a very good early season workout and 10 players managed to get a minimum of 10 minutes court time in the win. Minsk have plenty of players that can score points and their collective assists tally indicates this is a team that helps each other get a result. It is hard to effectively judge where Nahriya are with respect to this game because they have only played in one competitive game this season. That was in the semi—final of the Israeli Winner Cup tournament and they were demolished 96-66 by Maccabi Tel Aviv. The Maccabi side from Tel Aviv is a big team with a strong pedigree, so they can defeat teams convincingly, but this loss would have been a big blow to the hopes of the Israeli side who would have been looking for a confidence boost going into this game. There was some optimism though in the form of Gilbert Brown as he managed to offer up 16 points in the defeat. He’ll be under pressure to perform at a similar level in this game. The hosts are favourites but not overwhelmingly so and it may be that we have a close match in store for this game. You do think that the Minsk side should have enough to build up a decent lead for the second leg and you should take Tsmoki Minsk at -4, which is available at odds of 1.83. When it comes to the Over/Under market, make sure you look at UNDER 155.5 which is available at odds of 1.83. 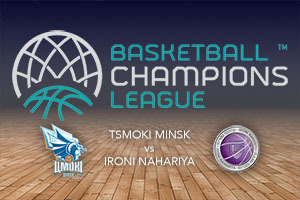 Have a look at our Basketball Odds and Lines page, where you can keep track of the history of the Tsmoki Minsk v Ironi Nahariya odds, as well as compare the offers from different sports betting sites.